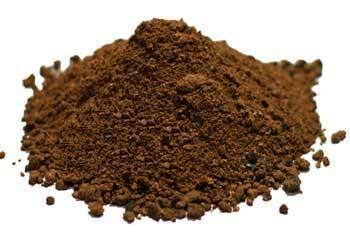 Refined Bleached Deodorized (RBD) Palm stearin is a vegetable fat, derived from palm oil. RBD palm stearin is solid fraction of RBD palm oil, obtained by fractionation of RBD palm oil, using simple crystallization and separation processes at controlled temperature. The physical properties of RBD palm stearin differ widely from those of RBD palm oil. RBD palm stearin is available in wider range of melting point and iodine value. RBD Palm stearin solid, yellow in colour at room temperature. RBD palm oil is cholesterol free and it has an anit-blood clotting effect, which helps prevent from heart dieses. It also contains vitamin E and vitamin D. RBD palm stearin contains approximately equal proportion of saturated and unsaturated fatty acids. It has iodine value 56 -60, which confirms presence of approximately 50% saturated fatty acids and 50% unsaturated fatty acids. It is highly stable against oxidation due to the presence of tocopherols, which acts as a naturel antioxidant and oxidized before the oxidation of RBD Palm stearin. It is mainly used as margarine in cooking and frying oil, shortening for making bakery products and low-cost soap noodles. 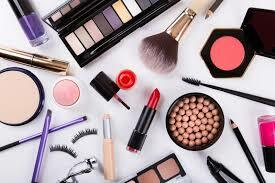 Oil Composition: RBD palm oil contains about 5-8% of diglyceride and approximately 1% monoglyceride. Diglyceride forms a eutectic mixture with triglyceride resulting in lower solid content. Monoglyceride and other minor components present in RBD palm oil don’t affect much the crystallization process. Polymorphism: Triglycerides present in RBD palm oil are polymorphic in nature and so it can crystallize in more than one form. Upon cooling, RBD palm oil crystallized to α-form crystal. Upon further cooling it gradually transforms in the order of α to β’ to β forms. β’ form is the most stable crystal, so for good separation, it is desirable to have β’ form. Cooling rate: This process affects the nucleation and crystal growth of RBD palm oil. When the temperature is sufficiently low, saturated glycerides of RBD palm oil start forming crystal and these crystals acts as nuclei for further crystallization of lower melting glyceride. This process results in the formation of larger cluster of crystals. 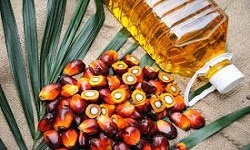 There are three industrial processes for fractionation of RBD palm oils: Dry, detergent and solvent process. Dry Fractionation: This is a fully physical process. 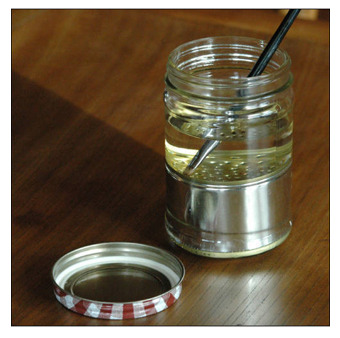 It does not require the use of any chemical or additives so there is no yield loss and no contamination. There are no chemical changes to RBD palm oil. First the RBD oil is heated to approximately 70oC and homogenized to fully melt the glycerides and then hot and homogenized oil is allowed to cool in controlled manner. Chilled water is circulated in for cooling purpose. When the oil temperature reaches the desired cooling temperature, which depends upon quality of RBD palm oil, the cooling process is stopped. Now thick crystallized mass is filtered using drum rotary filter and membrane filter to liquid RBD palm olein and solid RBD palm stearin. Detergent Fractionation: This process is mainly used for fractionation of crude palm oil. In this process, The RBD palm oil is first cooled in crystallizer with chilled water to allow the crystallization of higher melting glycerides. When it reaches to desired cooling temperature, crystallized mass is mixed with an aqueous detergent solution containing 0.05% sodium lauryl sulphate and magnesium sulphate. The crystallized mass is wetted with detergent and separate out in suspension in aqueous solution. Now it is sent to centrifugal separator where olein is discharged as lighter phase and stearin remain as part of the aqueous phase. 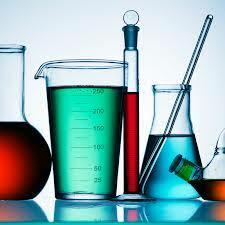 Solvent Fractionation: In this process, solvent like hexane or acetone is used for fractionation of RBD palm oil. This is the most expensive process due to use of solvent and solvent recovery machinery cost. In this process, RBD palm oil is first mixed with solvent and followed by cooling to desired crystals. Now the mixture containing partially crystallized oil and solvent is filtered using vacuum filter. RBD palm stearin is used to manufacture multipurpose and laundry grade soap noodles. 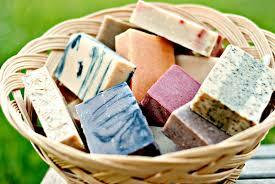 Soap noodles made from RBD palm stearin is differ in color from that of RBD palm oil soap noodles, so it finds applications only in low cost toilet soap bar and laundry grade soap bar. Palm stearin is the harder fraction of palm oil, containing a higher proportion of saturated fatty acids and TAGs with a higher melting point of 48–50°C. 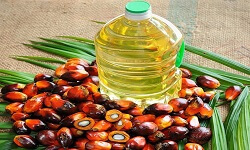 The palmitic acid content ranges from 49 to 68% and oleic content from 24 to 34% A much harder stearin containing 79% palmitic acid and a tripalmitoylglycerol (PPP) content of 60% is also available. 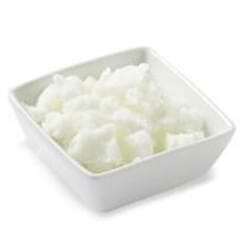 It is mainly used as hard stock for soft margarines and in infant fat formulas. Similar to super olein, a second fractionation of palm stearin yields another fraction called PMF, which is utilized in the manufacture of a cocoa butter equivalent. PMF can also be obtained by double fractionation of palm olein. 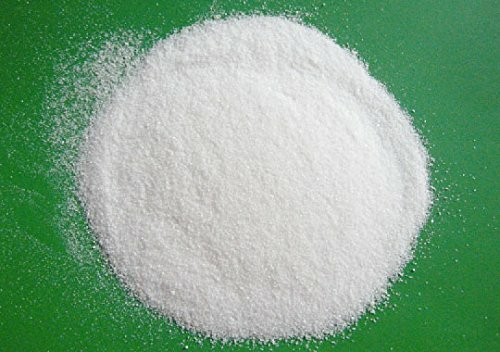 This PMF is more suitable for CBE than the one obtained from stearin because of its higher concentration of desaturated TAG and a steep solid fat content Palm stearin has a wide range of composition, physical properties, solid fat content, and iodine values. These variations result in different types of palm stearin, which allows food manufacturers a wide choice of materials for their formulations. 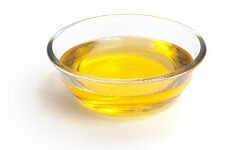 Palm stearin can provide the required solids in blends with unsaturated vegetable oils. It is a natural source of solid fat and can be used to provide increased stability for many types of foods that require solid fat functionality. Therefore, the use of hydrogenation can be avoided.